Starsailor is a British post-britpop band that was heralded on the release of their debut single, "Fever," in February 2001 as "Britain's best new band". Since then Starsailor has continued the rich lineage of its predecessors such as Travis, Stereophonics and many others. Formed in Wigan, UK by music students James Walsh (vocals/guitar), James Stelfox (bass), and Ben Byrne (drums), the band went through several guitar-heavy embryonic lineups before the arrival of Barry Westhead (keyboards) cemented their sound. Influenced by Tim Buckley (whose 1970 album gave the band their name), Van Morrison, and Neil Young, they played their first London show at the Heavenly Social in April 2000. At the same time, a demo tape containing the tracks "Fever," "Coming Down," and "Love Is Here" began circulating rapidly around the music industry. By the summer there was a queue of record companies to sign the nascent band. EMI won the race for their signature. After spending January 2001 on an NME-sponsored tour with JJ72 and Amen, Starsailor released their debut single, "Fever," to unanimous critical praise. A sold-out headline U.K. tour at the end of March preceded the release of their second single, "Good Souls," in April. Once again it was ecstatically received and reached the Top 20. As the single was released, the band went to Wales to record their debut album. They re-emerged in June to begin a summer of festival appearances sandwiched between an American tour supporting Doves and a couple of headline dates of their own. After achieving their first U.K. Top Ten hit with the single "Alcoholic," Starsailor's debut album, Love Is Here, was released in September 2001 to much critical fanfare, and a European tour closed out a highly successful year. The following year kicked off with the American release of Love Is Here in January, and a few weeks on the road for a brief North American tour, ending with a performance at the SXSW festival in March. Their sophomore album, Silence Is Easy, followed in 2004. 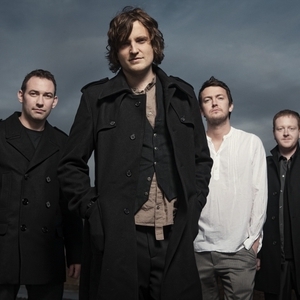 Starsailor released their third album, On The Outside, in the UK on 17 October 2005 along with the first single from the album, "In The Crossfire". "All The Plans" was released March 9, 2009, in the UK. Lead singer, James Walsh began to work on a solo project at the end of 2009. In November 13, 2009 it was officially announced by Lancashire Evening Post that Starsailor was on hold and that James Walsh was concentrating on his solo career. In an interview with VirtualFestivals.com he stated that at this moment he was working on his first solo album and that he was writing the lyrics with American songwriter and singer Suzanne Vega.